Schools, much like any other organisation these days, can’t exist in a bubble when it comes to reputation management and engaging with parents. Ofcom’s 2018 study of where teenagers go to get their news is very insightful and just as interesting is where the adults (parents) go. What are the implications? Here are our initial thoughts. Is social media disconnecting us from society? One of the major criticisms of social media is that it’s disconnecting us, as individuals, from society and from real physical interactions. But if a key element of ‘tribe’ is communication and connectivity then the digital world arguably holds unlimited bounds for tribes. If the internet has heralded the death of distance, what do these new kind of tribes look like? And do we relate to each other in different ways now that so much of our lives are lived online? 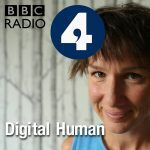 [/panel-header] [panel-content] http://blog.blippit.co.uk/wp-content/uploads/2018/02/TheDigitalHuman-20180226-Tribe.mp3 [/panel-content] [/panel] In this episode of The Digital Human (BBC Radio 4. ), Aleks Krotoski asks if rather than separating us, the digital world is helping us revive old tribal connections. It’s a fascinating way to look at schools and their parental communities for many reasons so do have a listen. 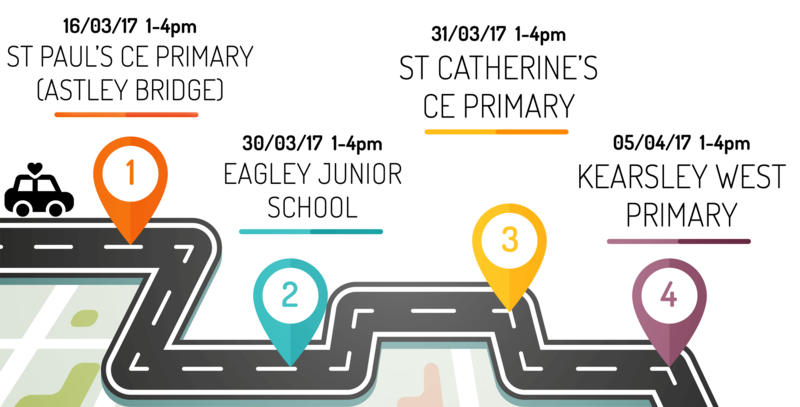 Book a place for this March & April 2017 at one of our face-to-face school-based afternoon workshops and amongst the latest good practice for schools, you’ll learn what hundreds of parents had to say about what it’s like to have children at a school where social media is proactively used. These are unique insights that we’ve turned into actions that you can take away and use in your own setting. We’ll not just be sharing this unique parental insight with you. As part of the workshop you’ll get the latest good practice for boosting meaningful engagement and advice on Facebook’s new focus on ‘video’. It’ll be fun (yes that’s allowed) and we’re also going to introduce you to some new apps that’ll reinvigorate your timelines too! Visit www.blippitsocial.co.uk information on Blippit Social in general. Here’s something that not a lot of people know. There’s a goal in mind for the web and that is to enable every website address to begin with https:// instead of http:// so that the data that passes between site and sender/visitor is encrypted. Google are big supporters of it amongst others. Here’s something that not a lot of people know either. This is the how the various web browsers that people use globally compare and yes, back there in the distance is Internet Explore & Edge with Chrome beating way out in front. Why are these ‘pub trivia’ facts important? Well, at the end of January this year, Google’s latest version of Chrome (v56) (the dead popular one) will ultimately start telling visitors to your school website whether it’s secure or not. What are the benefits of going secure? When you’re logging in to your school website to update it with new content, an encrypted secure connection (Secure Socket Layer Certificate) comes into it’s own. SSL means that when you enter your username and password to update the site for example, the login information travels securely to it’s destination making access to your website even more secure. Your parent & carer community will see ‘SECURE’ being directly associated with the school which has to be good. In 2011 Google announced that they were making changes to help secure sites do better in searches and to date this has remained the same. What can your school do about it? Your web site host will have a very easy and quick method of applying a security certificate to your website thus making it secure for visitors and site managers. It’s pretty rare that the school tech support would touch this job so unless they’re the person who built and hosted your website we suggest leaving them well alone. This Google site has a technical guide for how to implement an SSL so if your tech is the person they may want this link. Schools who have a Blippit Site are already compliant with SSL in place. We’d like you to apply an SSL certificate to our school website please. We’d like to do this for 12 months initially and need this in place by February or March at the latest. Can you let us know what we need to do on our part to do this e.g. forward an email from the certificate issuing authority to you when it comes? What happens if we don’t get a security certificate applied to the school website? You can carry on as you are and everything will stay the same. The main issue is that the world’s most widely used web browser will start telling visitors that your site is not secure and in this day and age that’s probably not what you want. Good luck & support a more secure web! LetsEncrypt runs the certificate authority that issues free SSL certificates so cost is no longer a barrier to using HTTPS and both Google and Mozilla to actively promote and recommend the use of HTTPS as standard. 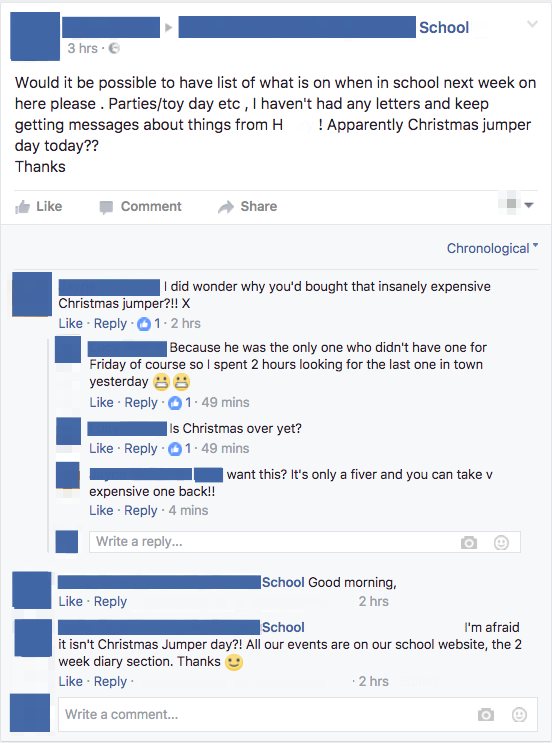 Why did some parents get sweaty about Christmas Sweater day? If, in the name of science, you want to cause stress in the life of primary school parents there’s one sure fire way to do it. Just change what the children have to wear in school on one day and then stand well back. What was that last one again? 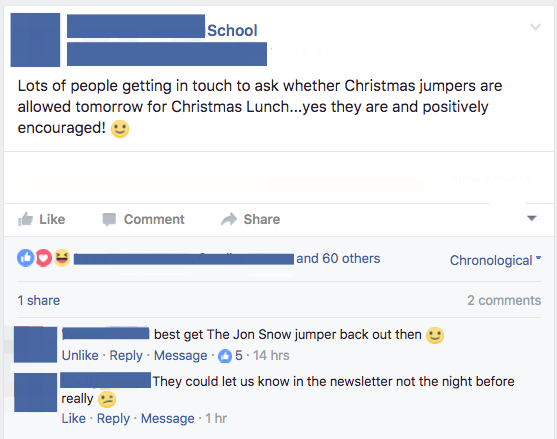 In short, for ‘pre-stressed parents’, finding a Christmas sweater for their child has the potential to festively and royally de-rail their normally stable emotional centre. How can a sweater have such an effect? Well along with applying one or more of the above top 5 tips, it’s probably worth stepping back a bit and looking at these two graphs about why people think they were bullied in 2016. 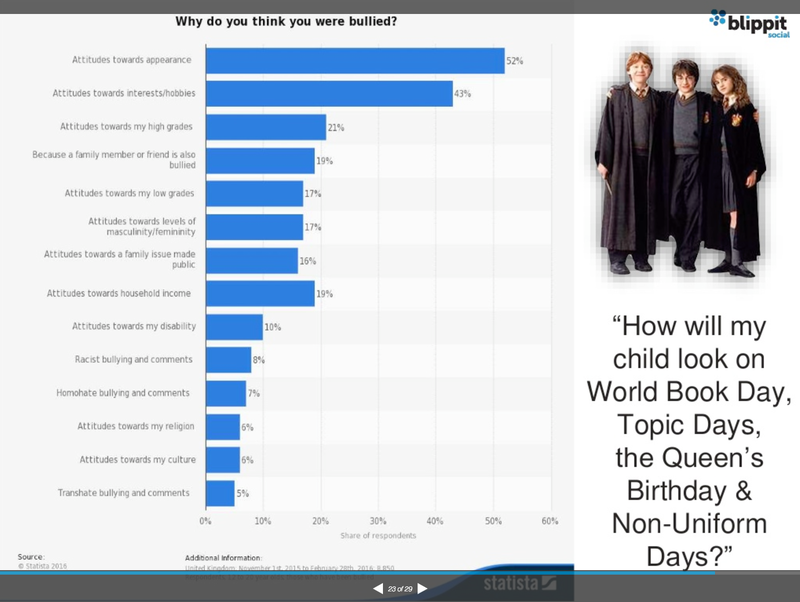 Take a look at the top reason. 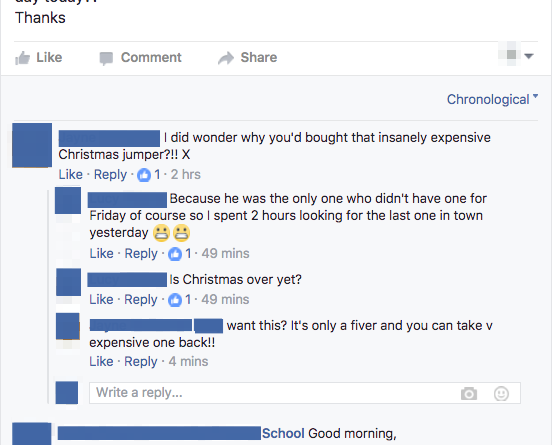 In reality, most parents, having once been in primary school themselves, don’t hear these kind offers as intended. They want their child to ‘fit’ or if they’re going to stand out it’ll be for having the most awesome sweater ever made. 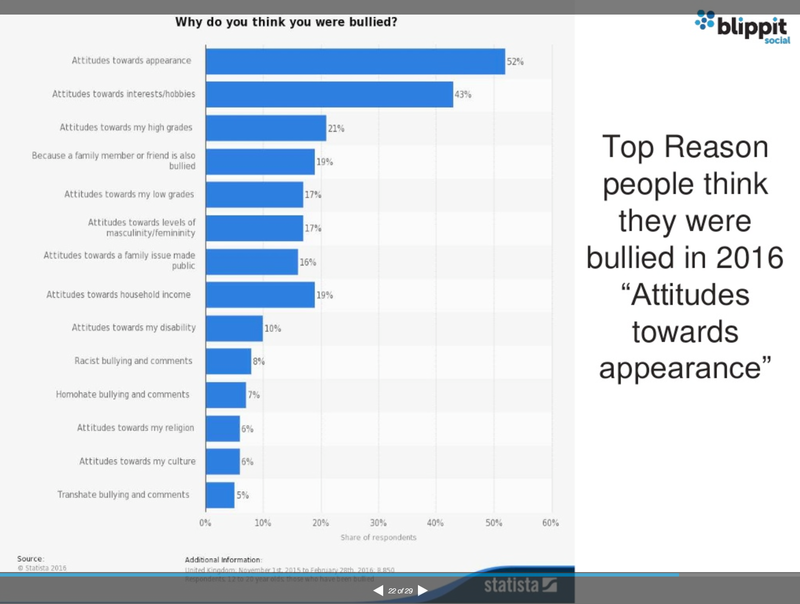 Back in the day when primary parents were in school it is very possible that the top reason people thought they got bullied was no different to the 2016 survey. Judging by appearance in today’s society has arguably never been more shamelessly normalised by popular media and at some time probably everyone has been guilty of doing it. 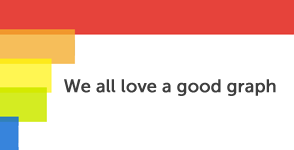 Even us perfect people. The instinct to protect offspring is hard coded and seemingly trivial things like Christmas Sweater day can be a trigger for this instinct to kick in. People act out of character. Should this kind of thing be kept out of school? It’s a difficult question to answer but perhaps, in amongst everything else that school leaders and teachers bear in mind every second of every day for every child, by stepping back a bit and seeing where parents are journeying from and to we’ll all have an even more wonderful <insert religious festival or special event name here> time. 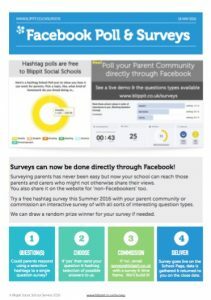 Is it possible to get valuable parental engagement right across a Multi Academy Trust using social media? Yes it is. In this recent talk (30/09/16) given under our exclusively education Blippit Social brand by founder John Bidder, you can hear tips, advice and hopefully get a better understanding of why schools choose to work with us as their partner in this challenging area. 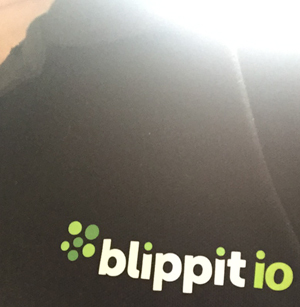 Yesterday I took Blippit to the National Museum of Computing – immediate neighbour of Bletchley Park. To be invited as part of their Bytes Festival and work directly with their visiting families surrounded by such history was not half-bad. Out of school you get such an insight into how parents relate to their children and learning as a whole. They share insights with you quite openly and comment on your limitless patience with their child who frankly drives them nuts most of the time. There’s noone marking, setting targets or observing when it’s just you and a family which makes for some very natural and easy steps forwards. One young man (Year 3) made an app and learned what HTML 5 markup language was as he worked with me on the side and his mum making encouraging comments as he progressed. To say he was ‘off his seat’ with excitement when he saw his app on mum’s phone (she downloaded a QR code reader to get it) is an understatement. I’ve been lucky (no doubt about that) to teach in many different schools and environments over the years sometimes as a ‘regular’ teacher, sometimes as an ‘advisory’ teacher and more recently as the ‘Blippit Man’. The ‘Blippit Man’ tag does generate extra attention and effort from children no doubt at all so my reflections are mindful of how children respond to people they view as ‘experts’ from the ‘real’ world. This bit of shine from an external expert isn’t sustainable and so it makes what teachers and children achieve together, day in day out, all the more remarkable. The National Museum of Computing is an awe inspiring place for anyone with the slightest interest in technology and they’re pretty rammed with school visits and tours but if you’ve not been yet, do yourself a favour and go! …and share it to your school Facebook page and ask parents to Share & Like it to that their network of friends (other parents) see the video and can act on it too. As a back up, it’d be worth mentioning the video via other communication channels for parents too. Here’s the video – hope you find it useful.